View this sample resume for a database administrator, or download the database administrator resume template in Word. To compete for top database administrator jobs in today's fast-paced tech world, you need to have a comprehensive resume that demonstrates your skills and experience. 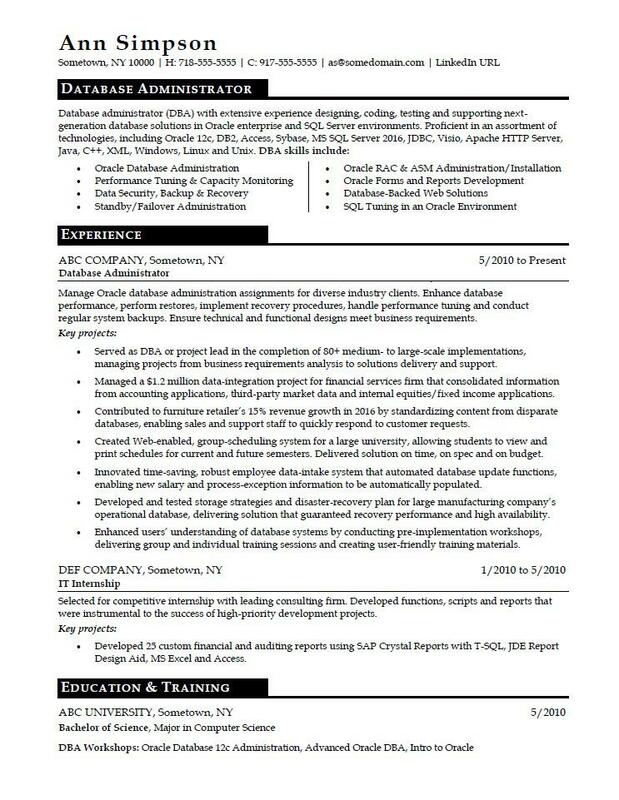 So if you're a whiz at writing code, but could use some guidance when it comes to resume writing, view the sample resume for a database administrator below and download the database administrator resume template in Word. Jobs for database administrators are projected to grow by 11% (or 13,700 jobs) from 2016 through 2026, which is faster than average, according to the Bureau of Labor Statistics (BLS). You'll find the highest level of employment for this job in the following states: California, Texas, Florida, New York, and Pennsylvania; and in the following metropolitan areas: New York City, Washington D.C., Dallas, Atlanta, and Chicago. As a database administrator, you can expect to earn a median wage of $87,020 per year, or $41.84 per hour, according to the BLS. Additionally, you can learn more about IT careers on Monster. Manage Oracle database administration assignments for diverse industry clients. Enhance database performance, perform restores, implement recovery procedures, handle performance tuning and conduct regular system backups. Ensure technical and functional designs meet business requirements. Managed a $1.2 million data-integration project for financial services firm that consolidated information from accounting applications, third-party market data and internal equities/fixed income applications. Contributed to furniture retailer’s 15% revenue growth in 2016 by standardizing content from disparate databases, enabling sales and support staff to quickly respond to customer requests. Created Web-enabled, group-scheduling system for a large university, allowing students to view and print schedules for current and future semesters. Delivered solution on time, on spec and on budget. Innovated time-saving, robust employee data-intake system that automated database update functions, enabling new salary and process-exception information to be automatically populated. Developed and tested storage strategies and disaster-recovery plan for large manufacturing company’s operational database, delivering solution that guaranteed recovery performance and high availability. Enhanced users’ understanding of database systems by conducting pre-implementation workshops, delivering group and individual training sessions and creating user-friendly training materials. Selected for competitive internship with leading consulting firm. Developed functions, scripts and reports that were instrumental to the success of high-priority development projects. Developed 25 custom financial and auditing reports using SAP Crystal Reports with T-SQL, JDE Report Design Aid, MS Excel and Access. As a database professional, you're used to tracking many moving parts in order to get the system as a whole to function. But maybe you're not as adept at getting your resume's parts in order. Could you use some help? Get a free resume evaluation today from the experts at Monster's Resume Writing Service. You'll get detailed feedback in two business days, including a review of your resume's appearance and content, and a prediction of a recruiter's first impression. Let the experts at Monster assist in a resume upgrade so you can confidently go after a great new job.